Dr. Coburn served in the United States Senate from 2005-2015 and in the United States House of Representatives from 1995-2001. 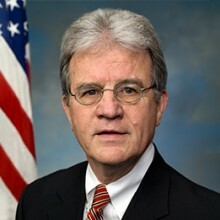 In the Senate, Dr. Coburn served as Chairman of the Federal Financial Management Subcommittee, Ranking Member on the Permanent Subcommittee on Investigations, Ranking Member of the Senate Homeland Security and Governmental Affairs Committee, and as a member of the Intelligence Committee and Finance Committee. In 2002, he was appointed co-chair of the President’s Advisory Council on HIV/AIDS. Dr. Coburn is a family physician, having delivered more than 4,000 babies during three decades of medical practice in Muskogee, Oklahoma. Prior to his medical career, Dr. Coburn managed and built a large ophthalmics manufacturing company. He is a graduate of Oklahoma State University, with a degree in accounting, and of the University of Oklahoma, where he obtained his medical degree.